Review: A$AP Mob Reaches Synchronicity On Cluttered "Cozy Tapes Vol. 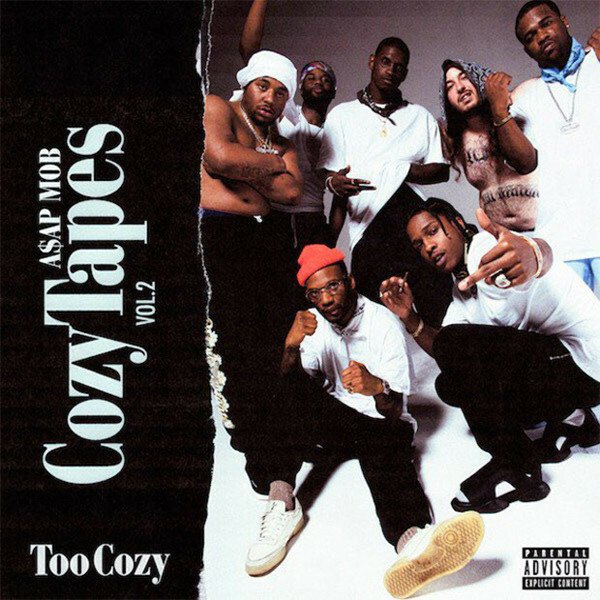 2: Too Cozy"
It was all good just 10 months ago when the impenetrable A$AP Mob dropped their debut Cozy Tapes Vol. 1. This first official Mob album was widely acclaimed and the baker’s dozen from Harlem seemed tighter than ever. Shortly after though, the roll slowed and the crew seemed to move in different ways. It was hard to imagine a world where anyone other than Rocky would make it big, but recently, everyone from Ferg to Nast has had a good chance to strive and prosper. The Mob roster continues to consist of notable fashion designers, seasoned producers, top tier rappers and others who just seem to hang around and enjoy the benefits of having those four letters precede their name. But despite their individual successes and responsibilities, the boys from uptown reunited for The Cozy Tapes’ second installment, Too Cozy. The biggest upgrade from the first Cozy Tapes is the consistent beat selection. The beats on Vol 1. definitely took a backseat to the Mob’s lyrical offerings, while Vol. 2 provides instrumentation that commands each track. Most of the beats consist of rattling snares and melodic 808 drums that drive a uniform basis without sounding totally identical. It seems deliberately similar to the Mob’s rhyming style that is so intricately woven throughout. RZA, Southside and Hector Delgado are some of the outside contributors to thank for this fluidity. The synchronized way they make music is unlike most in rap right now — especially since there are six official members rapping. The most notable instance where the Mob raps with one brain is on “Feel So Good.” Hit-Boy and Frank Dukes serve up a stripped-down beat with just a simple key swing and whispering drum pattern to carry the tempo. Rocky, Ferg, Ant, Twelvyy and Nast bring a variety of different styles while keeping the same energy. In short, no one outshines the other and no verse deserves to be skipped. Substance-wise, the Mob keeps it hypnotically focused on wearing fancy clothes in order to fornicate with fancy women. The lyrics on every song are a mixed bag of bravado and high fashion references that end up sounding like a Vogue catalog audiobook. Not only are they “serving your mama like Aunt Jemima” but they’re also “meeting with your favorite designer.” It’s hard to not be entertained by the frivolous fashion talk, even though all that’s really been uncovered is their wardrobe for next season. On Too Cozy we don’t necessarily get a look into the lives of some of the lesser-known Mob members — nor do we learn anything new about the shifting perspectives from the frontmen. But that doesn’t appear to be the point on this album. That’s really what their solo projects are for. What is becoming increasingly clear is when the Mob links up for an installment of the Cozy Tapes, it’s all about friends, fashion and aimless flexing.